Outside the city on a broad hillside, thick with green underbrush and shaded by poplar trees, Sam Ricks hacks through tangled knots of weeds with his machete - leaving no stone unexamined in his quest to identify the dead. 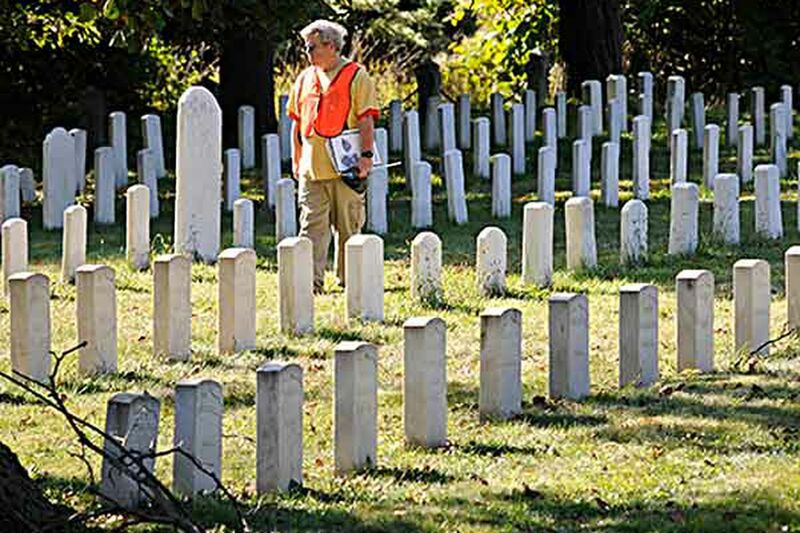 "After it was first abandoned, I drove through and it looked like the opening scene of Bridge on the River Kwai - a jungle overgrown with weeds," said Ricks, a volunteer with the Friends of Mount Moriah Cemetery. "The only one around here is this," he said, relishing arguably the most famous of the roughly 130 veterans whose burial markers the project has identified within the Naval Asylum Plot. He does not rest on those achievements, since the best records suggest that about 2,300 Navy and Marine vets - from the American Revolution through Vietnam - are buried in the area. There are a number of cemeteries across the state with similar stories to Mount Moriah - largely forgotten and in some cases officially abandoned, overrun by weeds and havens for vandalism, illegal dumping, crime, even packs of wild dogs. After the cemetery was abandoned in 2011 by the widow of the last known member of its governing association - a man who had died seven years earlier - local activists formed to organize volunteer cleanups, seek restoration funding, and call attention to the rich history of the burial ground. Ricks was able to find Dunbar's marker - the name had almost completely faded - but he was also surprised to learn the extent to which naval burial records were inaccurate or incomplete, and that time had nearly worn many of the headstones almost beyond recognition. He stops at the final resting place of William Henry Scholls, who joined the Confederate army as a 13-year-old drummer boy in 1861 and lived long enough to volunteer for naval duty during World War I, dying in a Philadelphia veterans' hospital in 1931. "This is a rare grave - one we can prove with Confederate records," he said. A small, barely readable marker shows where Thomas Johnson, a seaman who fought with the legendary John Paul Jones - "I have not yet begun to fight" - on the Bonhomme Richard against the British in 1779, was laid to rest. "Johnson was the first Revolutionary War sailor that we found," Ricks noted.